Radio Transmission Orchestra (RTO) night one of two. Bring your own radio. 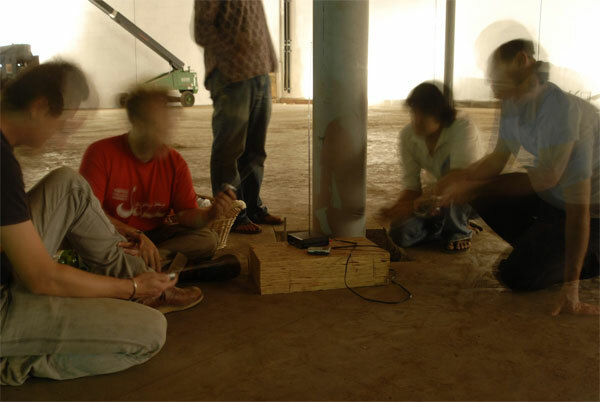 Radio Transmission Orchestra (RTO), a mobile multi-channel sound installation invites you to a battle of the 'bands.' On Sunday, October 1, the stage will be set to harness the invisible, ever-present energy intrusion known as FM transmission. You provide your own battle gear - boombox, FM cd player, self-powered emergency radio, etc. - and the battle field will be provided (formerly Cold Storage). Some radios will be provided. Electricity will be provided for your plug-ins. Radio Transmission Orchestra (RTO) is a completely mobile, extremely versatile, multi-channel sound installation. Combining pirate radio-broadcast and urban guerrilla art, RTO builds on a history of free speech and performance art in a simple yet effective way. RTO is a made up of 5 low powered, short-range FM transmitters and 30 battery powered alarm clock FM radios. The transmission is wireless, maintains broadcast regulations (more or less) set up by the FCC, and uses audio routed by a laptop/cd player. With the option of running up to 5 channels on independent frequencies, an area can be more effectively permeated. For instance, RTO could broadcast on five of the most popular channels in Los Angeles and pass through congested areas during crowded travel times, thereby saturating car stereos, office buildings, shopping centers, etc. RTO is a project by Aaron Drake and spent the summer touring Europe. Cooper Baker, Aaron Drake, David Earle, Caleb Epps, Adam Fong, Thadeus Frazier-Reed, Stina Hanson, Clint Haycraft, Arthur Jarvinen, Eric Lindley, Marc Nimoy, James Orsher, Phil Stearns, and Luke Taylor.